2nd Block - 9:03 - 9:58: HAL Christmas themed drama performance in gym for 7th and 8th graders. 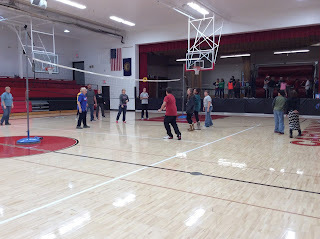 4th Block - 12:23 - 1:30 - End of semester awards and Nothing but Net Games will begin at 12:30. 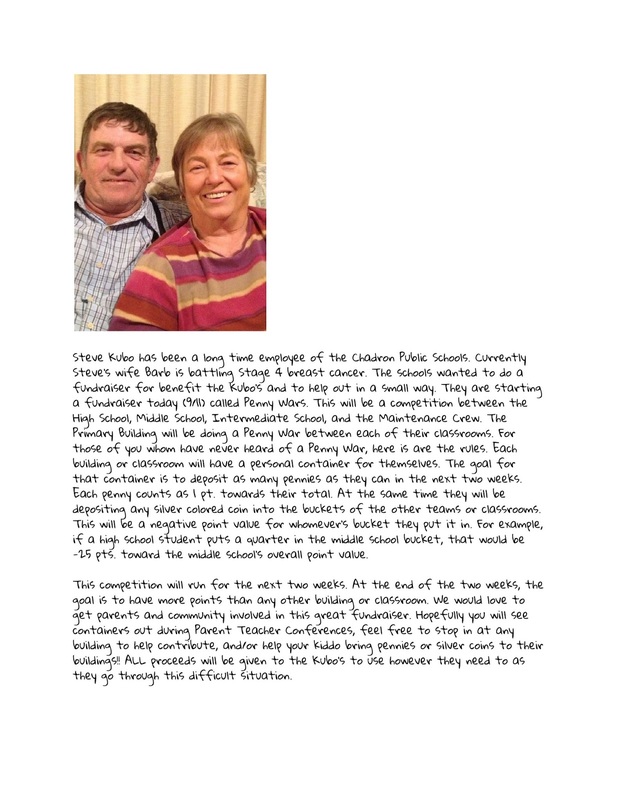 *Parents are welcomed to attend the HAL performances and awards/games. 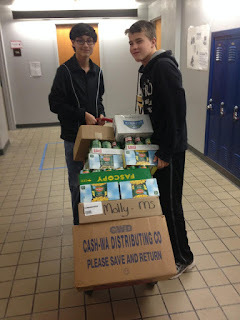 The CMS Caring for Sharing Food and Box Top Drive totals are in. Congratulations to the 6th grade class for collecting the most cans and box tops. 5th grade took 2nd place followed by 7th and 8th grade. 5th and 6th graders will compete in the Nothing but Net games on December 20th following end of the semester awards. The awards program will begin at 12:25 and the games will start at approximately 12:45. Parents are welcomed to join us for the fun! 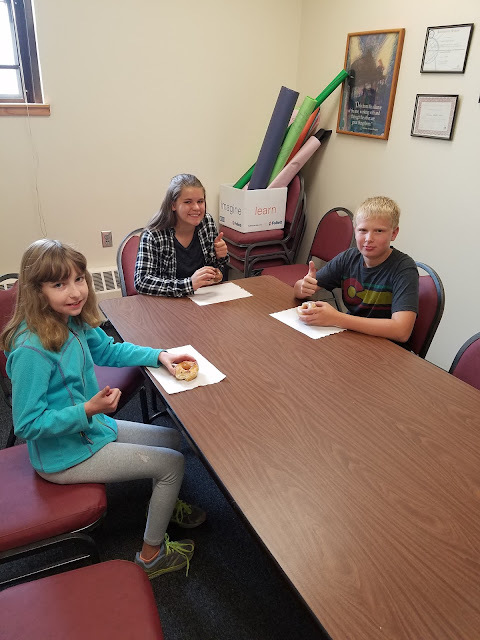 · Lucas Riley Ambrose, Chadron Middle School, grade 8 Brooklyn Hoffmann, Chadron Intermediate School, grade 4 Lillian Johndreau, Chadron Intermediate School, grade 3. The local second place winners are Jace Paopao, grade 4 and Sophie Watson, grade 3 at Chadron Intermediate School. The topic of the contest evolves each year to go along with the National Stewardship Week theme. One winner is selected in each of these divisions, K-1; 2-3; 4-6; 7-9; 10-12. The winners from each District were sent to the Nebraska Association of Resources Districts state competition where Lucas Riley Ambrose took first place statewide! His poster will be judged in January at the national competition in Nashville, Tennessee. 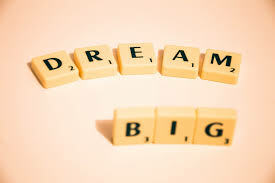 Typically, teachers bring the poster contest to their classrooms and encourage their students to compete. But if individual students want to participate outside of the classroom, contact your local Natural Resources District for information. The contest is open to all students in grades kindergarten through 12. NRD Poster Contest for the 4th year in a row!!! 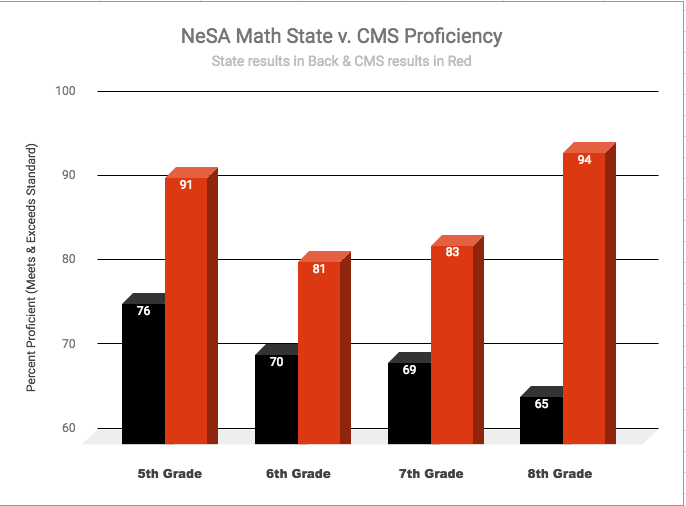 After a long embargo period, the Nebraska Department of Education has released the 2016-17 NeSA scores. 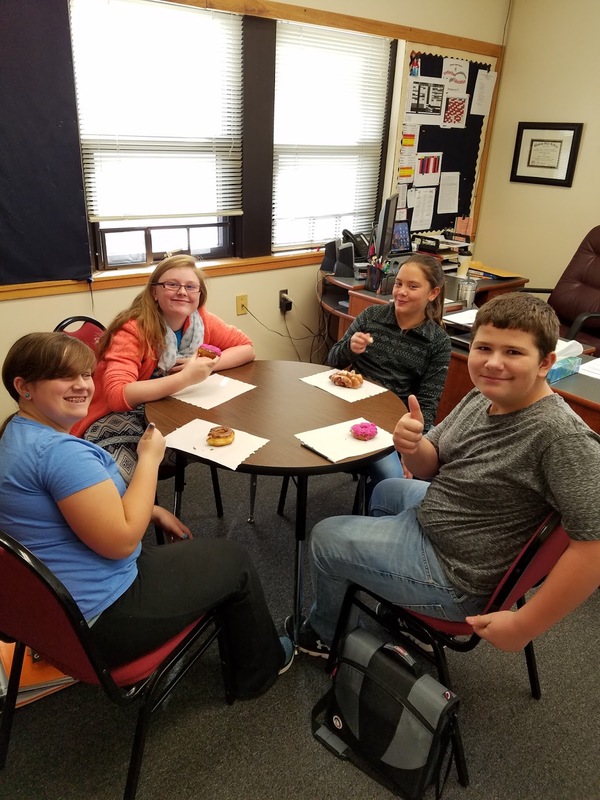 We are so proud of our students for the outstanding job that they did on their tests and we are proud of our teachers for preparing our students. Chadron Middle School out performed the state average at every grade level and in every subject on the 2016-17 NeSA test. 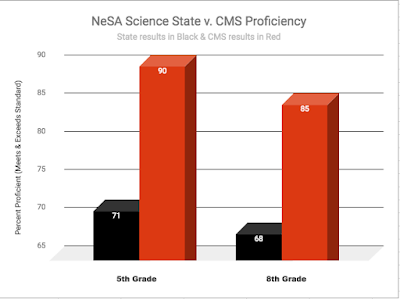 Two areas of strength for Chadron Middle School were on the mathematics and science assessments where over 80% of students in each grade level met or exceeded proficiency standards. 2016-17 was the first year that new English-Language Arts (ELA) test was administered. 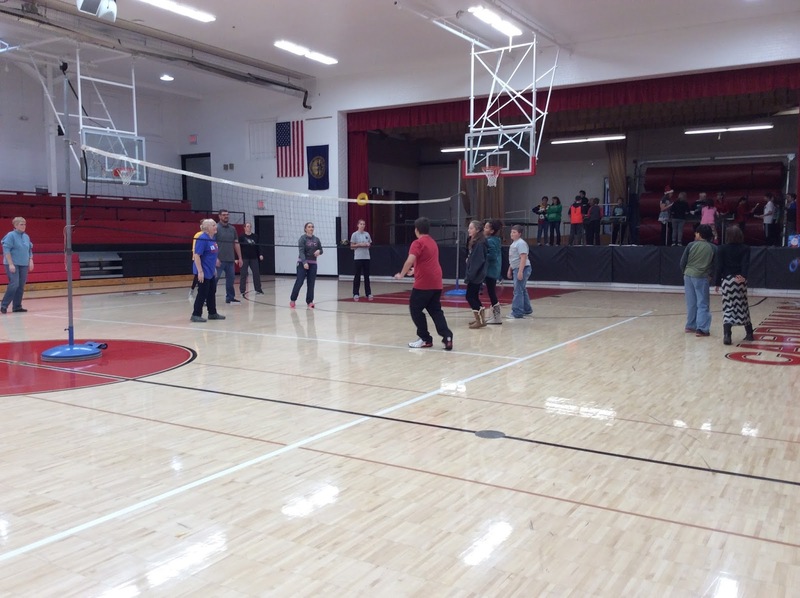 In addition, Chadron Middle School implemented a new Reading/Language Arts curriculum. Typically, scores go down when a new test is administered and when a new curriculum is adopted. That said, our students still out performed the state. 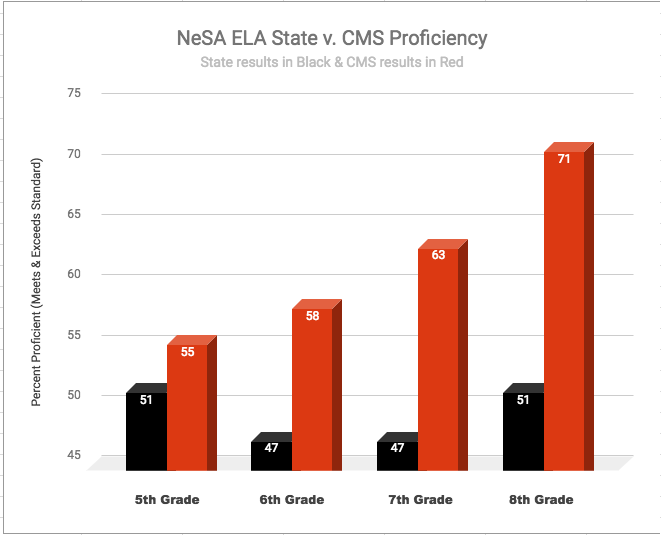 This is a testament to the alignment work and training that our ELA teachers and Mrs. Moore did before fully implementing the new curriculum. It also speaks to the effort that our students put into their studies and the excellent that support that they get from their parents. Again, congratulations to our students and teachers for their excellent performance! There will be a 6th grade test tomorrow, December 1st, over chapter five lessons one and two. Chadron Middle School will roll out our new Bully Reporting System from Crisis Go. Students can now use the Safe2SpeakUp app to report bullying, suicide/self harm threats, drugs/alcohol and weapons on campus. All reports are anonymous by default, but students can choose to add their name if they want. For students who don't have a device, there is online bully report form that has been linked to Mr. Dressel's blog page. 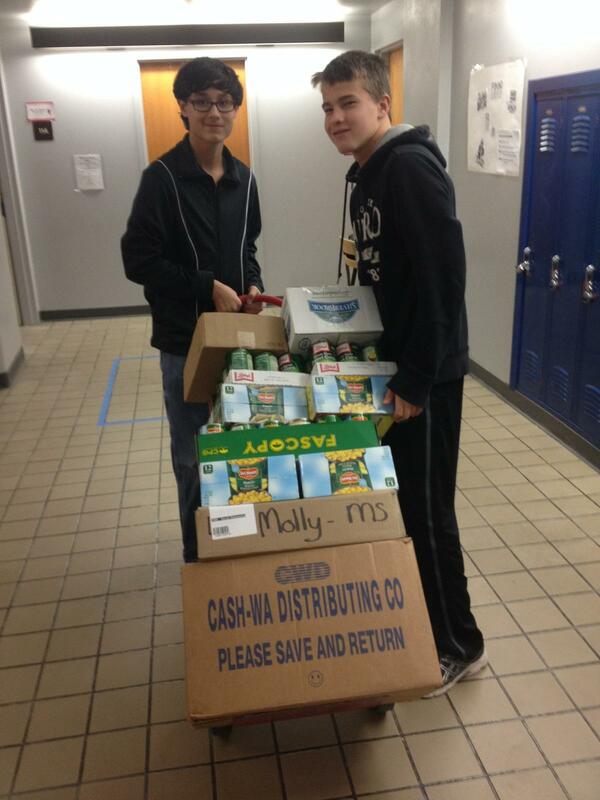 Chadron Middle School will kick off our annual Caring for Sharing Food Drive on November 8th. Students are encouraged to bring non-perishable food items to school through December 8th. All of the collected food items will be donated to a local food pantry. In addition, this year we will also have a Box Top Drive in coordination with the food drive. Chadron Middle School uses box tops to fund our T.H.I.N.K. Cardinal Pride Positive Behavior Support Program. In the past we have also used the funds on playground improvements and playground equipment like balls and bins. The Caring for Sharing Food Drive and Box Top Drive is a grade level competition. The grade that collects the most non-perishable food items and/or Box Tops will compete in the "Nothing But Net" games on December 20th, which is the last day of school for the semester. This has been a really fun event that students and staff look forward to. Parents are welcomed to attend the games and we will also do end of the quarter student awards including Cardinal Effort, Perfect Attendance and T.H.I.N.K. Cardinal Pride. 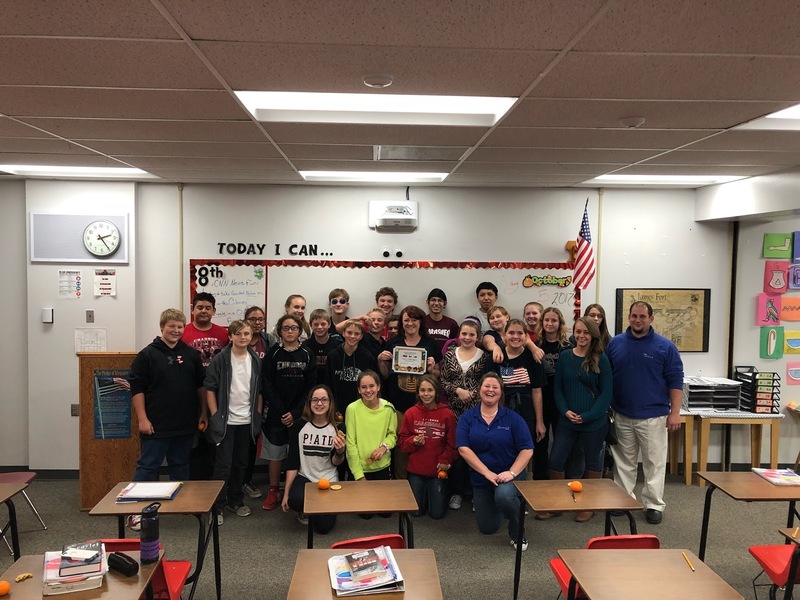 The Caring for Sharing Food Drive and Box Top Drive are two of the three school-wide service projects that Chadron Middle School sponsors annually. As the holidays approach, both of these events are an excellent way for students and their families to help out their school and community. 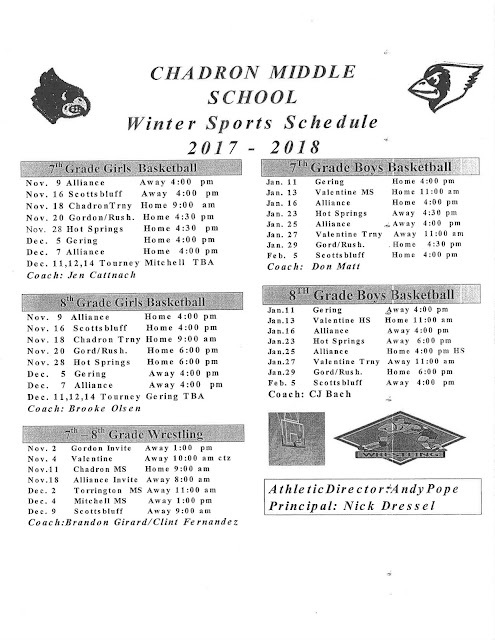 CMS wrestling will attend the Scottsbluff Invite on November 4th instead of Valentine. Due to Football Playoffs, Valentine had switched their invite to Tuesday the Nov. 7th. with a 4:00 pm start and we would get home too late. Wrestling - October 17th after school in Mr. Fernandez's classroom. Girls' Basketball - October 20th after school in the gym. 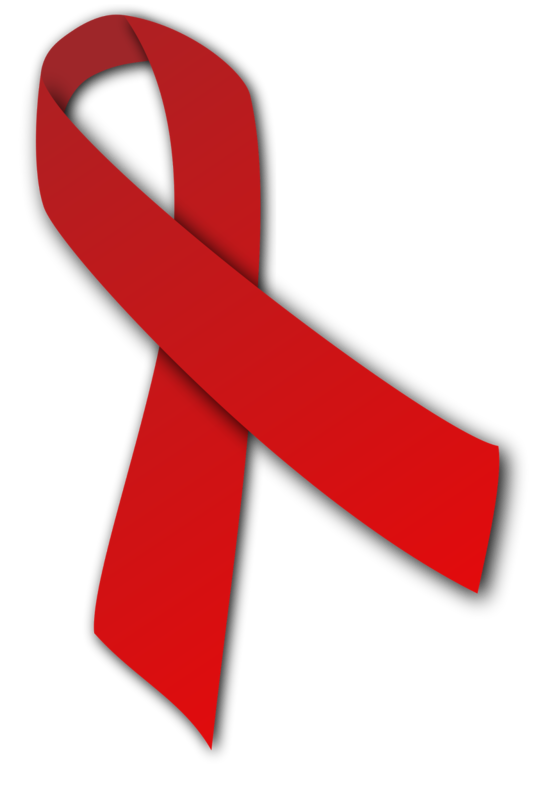 Chadron Middle School will celebrate Red Ribbon Week on October 23rd-26th. Red Ribbon week is a national alcohol, tobacco and other drug and violence prevention awareness program that is celebrated by schools throughout the country. Part of Chadron Middle School's tradition is to have themed dress up days that go along with anti-drug slogans. Students are encouraged, but not required to participate. Monday, October 23rd: PJ Day (Dress up in Pajamas) "Put Drugs to Bed"
Tuesday, October 24th: Blast from the Past (dress up in era/decade clothes) "Make Drugs History"
Wednesday, October 25th: Crazy Day (dress crazy) "Doing Drugs is Crazy"
Thursday, October 26th: Spirit Day (dress in school colors) "Get RED of Drugs"
Congratulations to our CMS T.H.I.N.K. Cardinal Pride ticket winners for the week of October 2nd. Keep up the good work kids! The final drawing for the quarter will be during our end of the quarter awards assembly at 1:00 on Friday in the CMS gym. We will draw 3 tickets for the week and then 2 tickets for the end of the quarter prize. In addition, Cardinal Effort Awards and Perfect Attendance will also be awarded. Parents are welcomed to attend. Mrs. Traphagan has been selected as the UNWNRD Teacher of the Month for September. The Chadron Chamber of Commerce sponsors the treats for the party! This is Mrs. Traphagan's 2nd year at Chadron Middle School and teaches 7th and 8th Grade Social Studies. In addition to her teacher duties, Mrs. Traphagan helped lead the creation and implementation of the T.H.I.N.K. 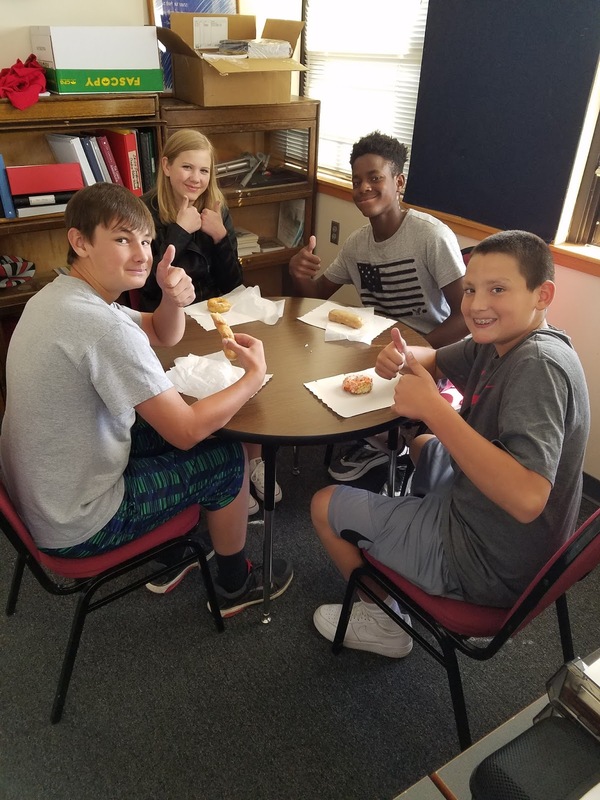 Cardinal Pride Positive Behavior and Intervention Support program that started at CMS this year. Congratulations, Mrs. Traphagan on a well deserved honor! 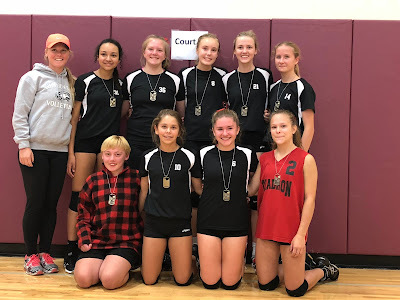 CMS 8th graders took first place after going 3-0 in action Saturday at the Torrington, WY invite, which included 8 teams in their bracket. This was a repeat title as they triumphed last season in the same tournament! This year their wins came over Torrington, Scottsbluff and Gering (Gering was opponent in championship game for 1st place). Congratulations ladies! Penny Wars - THANK YOU! I wanted to take a moment to send out a quick and HUGE THANK YOU to each and every person who made the Penny Wars Fundraiser a success! Without the help from the CPS staff, principals, ​students, parents, and community members, we NEVER would have raised $2814 for the Kubo family. I know without a doubt that the money you all raised has not only lifted a piece of the financial burden that they are feeling, but it has raised their spirits knowing that they have a community that is backing them in the battle that Barb and the family are currently going through. Your efforts are appreciated more than you will ever know! Thank you! CMS will host "Parents as Partners" meeting on Monday, September 25th at 6 PM in the CMS Library. All CMS parents are welcomed to attend. We would love to have your input! Road Construction is Almost Done, Now What? Road construction is nearing completion and barricades should be removed sometime on Friday, September 22nd. I want to give a big HIGH FIVE to Fuller Construction for completing the project way ahead of schedule! I did not think that roads would be open until mid-October, so getting them back in the last week of September is a nice surprise! I'd also like to thank everyone for their patience during the road construction. Overall, I thought that traffic moved smoothly and it was great seeing so many of our students walking and riding bikes to school. When Ann Street and 6th Street are reopened, we will go back to our regular drop off and pick up procedures. As a reminder to our veteran parents and as an introduction for our new parents, I've created the maps below to help illustrated what AM drop off and PM pick up should look like. Please note that the middle school parking lot will remain closed from 7:30-3:30. In the AM, it is preferred that parents drop off their middle school students by the playground on Ann Street and turn east on 6th to Cedar. The other option is to drop students off on the north side of the building. 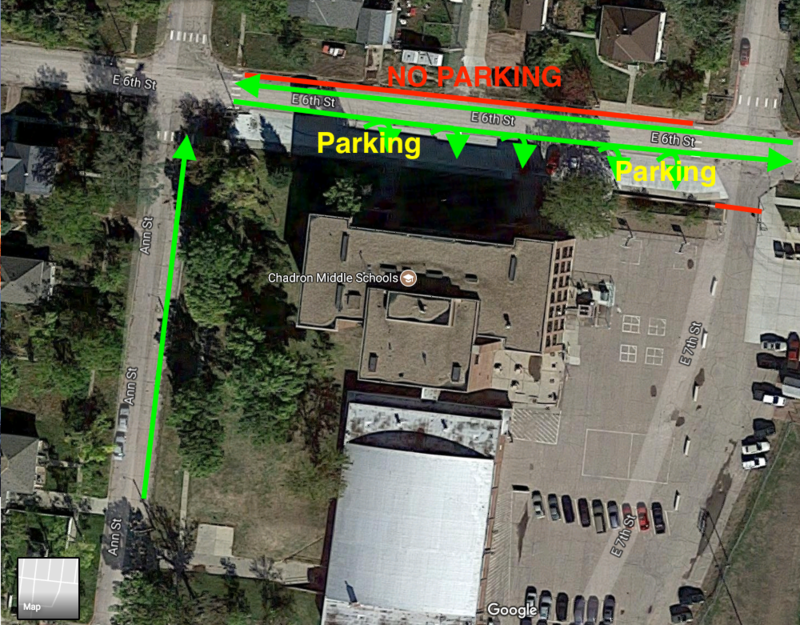 If you need to park, please park east of the tree on the north side of the building. Drop off on the north side of CMS is a drive through and all drive through traffic must move east on 6th toward Cedar. There is no parking or student drop off on the north side of 6th street because there is a lot of traffic in the morning and afternoon. 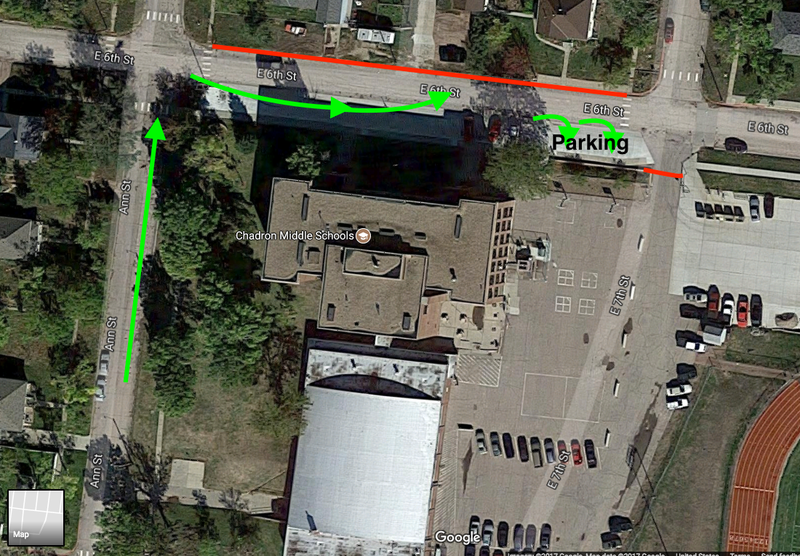 In the PM, parents pick can their students up on Ann Street or park on the north side of the building to wait for their child. When backing out, please drive east down 6th street as to not cross traffic. Remember there is two-way traffic on 6th Street. Again, there is no parking or student pick up on the north side of 6th street because of the heavy traffic. Thank you again for your patience during the road construction and if you have any questions about our regular drop off and pick up procedures, please contact me at 432-0708 or nichlas.dressel@chadronschools.net. Hope this letter finds each of you and your families enjoying the beautiful fall season! We are writing to let you know the 2017-2018 Chadron Public Schools Health Screenings will be held on September 25 and 26, 2017. The state of Nebraska requires students in 1st - 4th, 7th and 10th grades to complete a hearing, vision, dental and height, weight and blood pressure screenings. Students in 8th and 11th grades will complete a hearing and vision screening. These screenings are not only a requirement by the State of Nebraska but also very important in early diagnosis of potential barriers in a student’s ability to learn and grow! If you do not want your child/ren to participate in the free screenings, you will need to come to the school and sign a waiver. Due to the screenings being a state requirement, you will need to provide the school with screening results from your private provider (hgt, wgt, BMI and BP), eye doctor, dentist and hearing specialist by December 1, 2017. It's hard to believe, but we are already at the mid-quarter and that means Parent-Teacher Conferences (PTC)! CMS will host PTC on Thursday, September 14th from 2-8 PM in the CMS Gym. CMS will have a 1:30 dismissal on that day. The rest of the district will have a regular schedule. That said, we welcome and appreciate parent attendance at any time and teaches will be available from 2 PM - 8 PM. Please note that shared staff (Art and Music) will be available at CMS from 3:20-5:30 before they have to leave for CHS Parent-Teacher Conferences. The school year is off to a great start and we hope to see all of our parents and students on Thursday. *Friday, September 15th is a 1:30 dismissal district-wide. Pride Ticket drawing on Friday, September 4th! Keep up the good work! Pride ticket drawing on September 1st! Keep up the good work! If you haven't signed up for my Remind101 text messages, here's the information! Throughout the school year, I send text reminders about schedule changes, school emergencies special events or school closings to anyone who has signed up for the service. If you'd like to add yourself to the list, text "@chadaronms" to the number "81010". If at anytime you'd like to remove yourself from this private text messaging service, simply reply "@ LEAVE". Three Chadron Public Schools students were featured in Summer 2017 edition of Humanities Nebraska Rapport. Chadron High School students Grace Sorenson and Lauren Collins represented Nebraska during the National Endowment for the Humanities' Day on Capitol Hill. Eighth grader, Tyler Kaus, was recognized for receiving the Outstanding Affiliate Entry award at the National History Day competition. Congratulations to Grace, Lauren and Tyler for this recognition and thank you for being outstanding representatives for Chadron Public Schools! OUR BOOK FAIR IS OPEN – ONLINE!! Our school book fair is open online NOW through September 12th! Extended selection for YOUNG ADULT/MIDDLE SCHOOL! VISIT OUR ONLINE FAIR TODAY!